Wouldn't you like to be a Piper too? The Great Hihgland Bagpipe is an amazing instrument to hear and to play. Learning to play a bagpipe is one of the greatest challenges in music as it requires much more than talent or natural musical ability. In fact dedication, practice, and following instructions are much more important for developing the technical skills and physical coordination needed to be a piper. I also feel that the piping instructor should have a certain commitment to be thoughtful, encouraging, and sensitive to the needs of the student. Not everyone learns or comprehends things the same way, and instruction should take these differences into account. The Highland Bagpipe is not just fun at parties. Despite its novelty, it is a very real instrument with a long history and a large repertoire. There is a lot to know about bagpipes before one decides to play one. 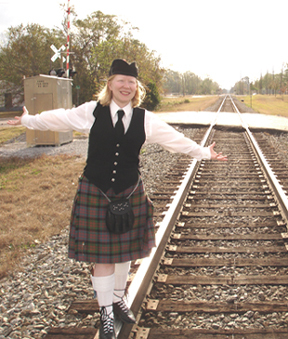 To be sure you are really interested in playing a bgpipe, ask some pipers what it takes to learn to play, or read about bagpipes here, to get a beginning overview of what bagpipes are all about. You may be surprised. Besides teaching the best I possibly can and working with each student according to his or her own needs at the appropriate pace, I also aim to make lessons and learning the bagpipe an enjoyable experience. I take things at a speed which will allow thorough covering of all materials in order to build a musical foundation which will make the future brighter and more pleasant. I do not take the fast track at the expense of a student's education. My goal - in short - is to help students reach their goals, while taking the time necessary to yield a rewarding result. In order to make bagpipe lessons a postive experience for the students and for me, I have developed a fairly detailed Studio Policy to help with this. It may also answer some further questions anyone might have about how I will conduct business and bagpipe lessons. Until the recent past, bagpipes have been taught in a very old-fashioned way, which - unless the student has prior musical experience - leaves a piper with knowledge of nothing but bagpipes and bagpipe idioms. This can make it difficult for the piper to adapt in situations where performance and cooperation with other musicians are required. I will make every effort to see that a student understands music as well as bagpipes. Many casual pipers remain so becasue they never firmly grasp basic musical concepts which would make control and skillful playing more accessible to them. From the start I will employ use of the metronome and slow playing of rudiments and tunes with a gradual acquisition of speed. This helps the piper learn control over his or her fingers and the instrument. I will also - as soon as possible - stress the bagpipes as the practice instrument as well as the performance instrument. Many pipers will openly tell you that they play better on the practice chanter than on the pipes, and this should not be the case. The practice chanter - as it is easier to play - can hide or obscure issues that the piper needs to address in practice. I will also enrich the piping student's education with other musical sources which will help the student to understand the place of piping and its forms in the grand scheme of music and music history. I will also teach music theory, rhythm, sightreading and memorization skills. The basis for the lessons will be the Bagpipe Solutions by John Cairns method, which is still in production. The first seven books in this program are curently available, and upon its completion, this will be the first comprehensive method used in piping education. The method will include 16 volumes which will cover many years of the piper's study, from beginning student to advanced professional. These books are designed to function much like teaching methods for other instruments, such as piano or clarinet. I will also provide supplimental material from other programs and of my own design when necessary. Who can be a piper? The main requirement is a commitment to learn. The bagpipe is not the sort of instrument which can be learned simply by osmosis or by fiddling around with it once in awhile. Many people who set out to be pipers realize how much is required of them and quickly lose interest. There is a lot of work involved, but the work doesn't have to be a chore if the student is attentive to instruction and willing to sacrifice some free time. A resolve to practice at least thirty minutes a day in the beginning is a great foundation for becoming a piper. Age is not much of an object, though it is a good rule that children be around age 8 or 9 before starting to learn. However there are some very focused 5 and 6-year-olds who have begun the process. The physical strength to support and play a bagpipe may take longer to come at young ages, but this can definitely be dealt with by use of smaller bags, custom fitted blowsticks and properly tied-in drones. A lot of older folks have found piping a satisfying hobby as well. Their main obstacle is not physical but mental. Often adults have difficulty in following literally the instructions given by the teacher. Assuming that they know more than they do is what holds adults back most of the time. But there are many who commit to learning correctly and reach very high proficiency in a short time - comparable to the timeframe in which some younger people learn. Prior musical knowledge can help, especially in the early stages, but there is a point at which some retraining of the music brain might need to take place. 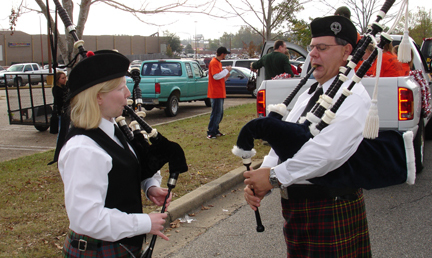 Piping is a specific style of music which may have some points that are counterintuitive to more common musical practice. But a piper who is already a musician will benefit from this knowledge and likely play more musically at an earlier stage. This having been said, pipes can make a great first instrument. It is possible for a student to learn basic musical principles while learning the bagpipe as he would with the piano or the trumpet. So musical knowledge - though good - is not required. As the ability to play increases and the piper aspires to bigger goals, more demands will be made of his or her time. However these increases are gradual and will be natural as the player's desire to continue increases. Over time a regular thirty-minute practice will exapnd to fill an hour as more and more detailed material is added. People who are ideal candiddates as far as time goes would be singles, retirees, children, homemakers and homeschoolers - but spouses and parents with very understanding families can also do great. Apart from any obvious physical limitations, pretty much anyone who has the desire and discipline can play the bagpipes. Of course the basic make-up of the person will in some way affect their skill and rate of progress. But if the pipes are learned and practiced correctly, regardless of the talent or skill level of a student, they are very enjoyable to play, and anyone who completes the journey to piperhood definitely has something to be proud of. See the Studio Policy for information on how these and other bagpipe supplies can be obtained.